While we think of modern garden design as being a relatively recent development the modern principles of contemporary garden design; simplicity, minimalism, geometry, water, structural planting and conservation can be traced back over a 1000 years, to the deserts of North Africa and the early gardens of southern Spain. To the Moors of North Africa, water was their most precious commodity and they were experts at designing ingenious ways in which to capture, store and irrigate their crops with it. 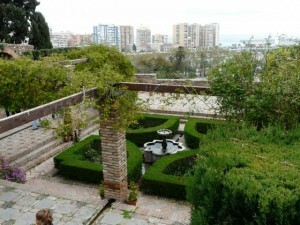 Converted to Islam, they combined their engineering ingenuity with the style and spiritual practices of the ancient Persians, to create a sophisticated garden style that combined water with both practical and aesthetic uses, many inspiring examples of which can be seen today in southern Spain. In Islamic culture, water plays both a prominent physical and spiritual role. 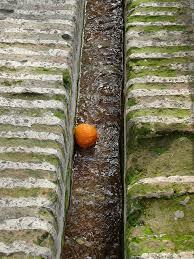 Necessary for irrigation and drinking, water was also required for ritual purification and bathing. The Moors had always seen water as a valuable commodity and used their expertise with water to develop sophisticated systems for reusing it within the landscape. In their gardens, both plants and water were used in minimalist but purposeful ways. Islamic garden design is characterised by a cross axis with a central water feature. The four-quadrant, courtyard garden representing the four rivers of paradise from the Koran. This geometric layout met both spiritual and practical demands. With evergreen and deciduous plants set out in straight rows within the garden to provide; shade, wind breaks, strong design structure and to make watering easier. Their gardens would be planted with drought-tolerant plants like; acacia, myrtle, oleander and cypress, favourites still today in Spain and in the Spanish designed, dry gardens of Mexico and California. 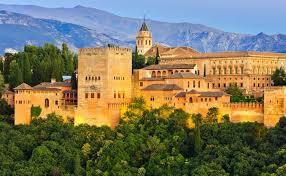 The Alhambra in Granada, Spain was the Sultan’s palace. This Moorish palace is breathtaking in the beauty of its interiors and contains all of the intricate architectural details of the Moorish style; their exquisitely and intricately carved stone fretwork, endless arches, vibrant colours, and geometric patterned tiling. 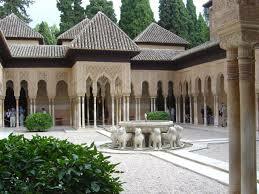 However, the main decoration of the Alhambra is the water. Everywhere is heard the lush gurgle of water from fountains, pools and irrigation tunnels. In the arid lands of Islam, water was both life and wealth. 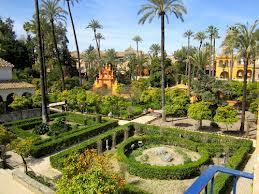 The Sultans of southern Spain flaunted this wealth on ponds, fountains, waterfalls and irrigating plants. Their design legacy, especially in terms of what we can see today, was considerable. 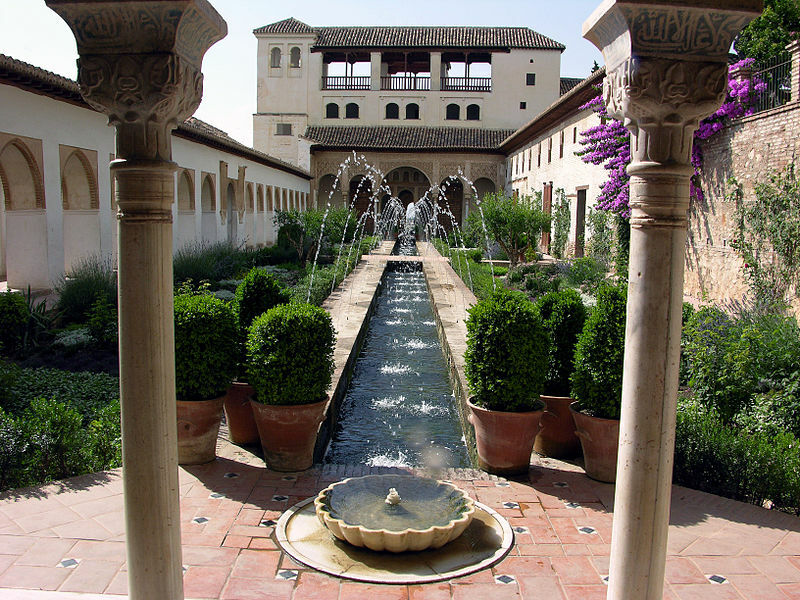 The iconic Patio de la Acequia, or Water Garden Courtyard, is considered to be the most perfect example of a Spanish-Muslim garden. An enclosed garden built around a long water with rows of jets forming graceful water arches over the rectangular pool. 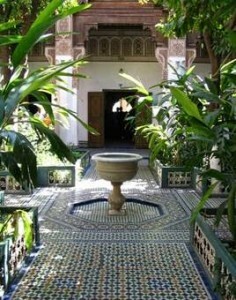 This garden, as with others in the Islamic world, is a place for resting, not for walking. The other emphasises of an Islamic garden are water and shade – two features that stand in stark contrast to Islam’s arid desert homeland. Together these features make the Islamic garden a representation of paradise on earth. The fountains in the courtyard are a 19th century addition; the original water feature was intended to be a still, flat surface of water, providing a reflection of; the sky, the surrounding architecture, and the surrounding lush, structural plants. 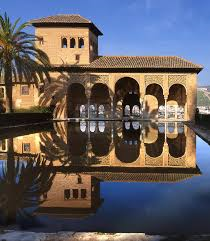 In addition, to the aesthetic qualities of both light and reflection, the Moors also appreciated water’s other important quality, that it helped cool the air within the confines of the courtyard. 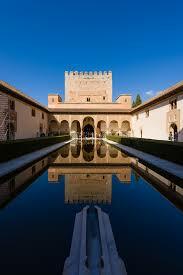 The Court of the Myrtles or, Patio de los Arrayanes, is another perfect example of the use of water, symmetry and simplicity in the Alhambra palace. This elongated pool seems to increase the size of the Palace, by its captivating mirror effect. The grandeur of the palace is accentuated by these reflections in the water. Gardens were designed for the senses, and the myrtle hedge around this rectangular pool create a delicate scent when in flower. 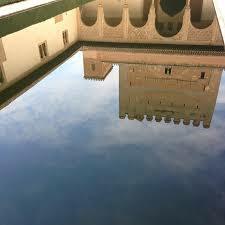 The Palacio del Partal is another example of this mirror effect on the water. The arches of the Partal façade reflected in the rectangular pool. The Mezquita or Great Mosque in Cordoba, Spain, provides good examples of water conservation that could be applied today. 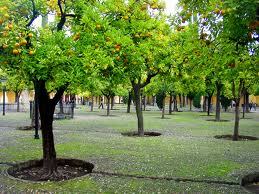 Patio de los Naranjos is a courtyard which has a rectangular pattern of orange trees set in a grid of irrigation channels with stone watering circles for each of the trees. These channels are fed from the gables of the roof which capture the water with minimal evaporation loss. The trunks of the trees neatly replicate the forest of columns (850 within the Great Mosque now a Cathedral). The courtyard was originally planted with palm trees. The orange trees from which the Orange Tree Court takes its name were planted in the 15th century.The fragrance, cool water and shade of the aged trees is refreshing. 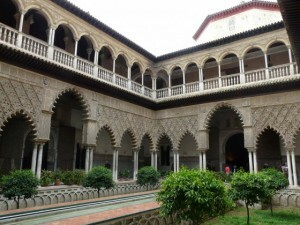 During the Reconquista King Ferdinand III conquered Seville, Spain, and moved the Castilian court to the Alcazar, a Moorish fort that predates the Alhambra. The strong geometry of the garden layout is reinforced by structural evergreen planting of shoulder height Myrtle, tall Cypress trees, and Lemon, Orange and Pomegranate fruit trees all irrigated by water captured from the roofs. 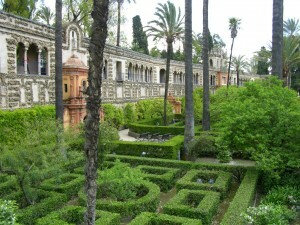 Courtyards within the Alcazar were organized into four quadrants with recessed flowerbeds running alongside the water features. Seats are shaded by evergreen magnolias and fan palms and the gardens are planted with lemons, jasmine and myrtle; climbing roses, wisteria, acanthus and box. Unusual espalier wall-trained bitter Seville oranges perfume the air. 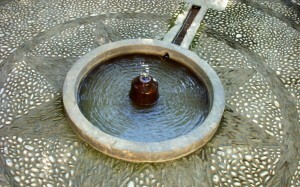 Water gently splashes in the fountain bowls at the centre of each garden. 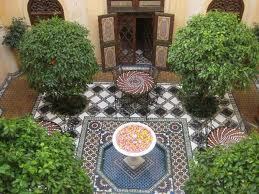 and today the adaption of the Moors’ ideas continue to provide the inspiration for our modern gardens.